FM Carlos Mena, a Cuban national, won the 2012 Southern Open this past weekend. 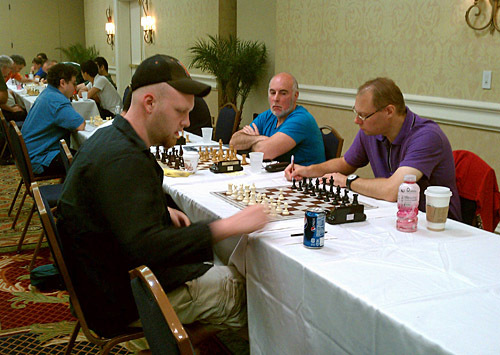 The 20th Annual Southern Open was held from July 27th-29th, at the Wyndham Orlando Resort. Harvey Lerman was the organizer and Steve Emmitt was the tournament director. The tournament was held during heavy vacation season and there were many events being held including a large Indian Pentacostal Church convention! Parking was at a premium during the weekend and the hotel ground was spread out like an apartment complex. Not exactly ideal if you flew into Orlando and didn’t rent a car. 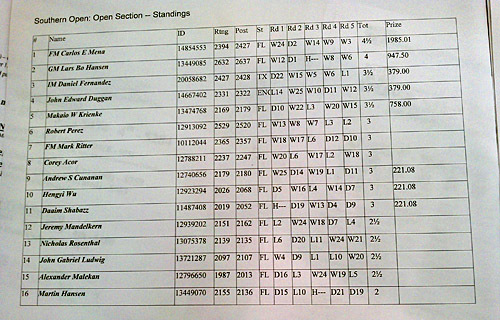 With a field of 25 participants in the Open section (213 overall, 8 re-entrants), Mena won his last-round game against IM Daniel Fernandez to score a convincing 4½/5. Fernandez commented on that game saying that it was equal at some point in the middlegame before his position came crashing down. Pena drew with GM Lars Bo Hansen, who has moved to Florida in the last year or so. with FM Mark Ritter looking on. Hansen came in second on 4/5, while Fernandez, John Edward Duggan of England and Makaio Krienke came in 3rd-5th with 3½/5. Krienke won first under-2300. Other prize winners in under-2200 were Andrew Cunanan, Hengyi Wu and Daaim Shabazz with 3/5. 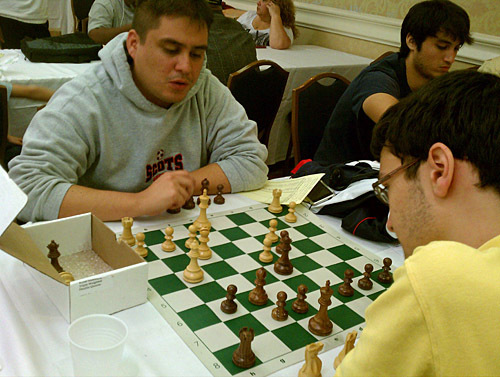 Here is an exciting game from round four between IM Daniel Fernandez, who now lives in Houston, and young phenom, Robert Perez (2529). Fernandez sacrifices two exchanges! IM Daniel Fernandez and Robert Perez analyzing after the game. Good report and great photos. Mena has been having great results in Florida this year. Thanks Larry! We’ll have to make it tough for him. Cubans are generally good fighters. That’s what I found out at the Capablanca Chess Club in Havana. Taking into consideration the modest time you have for chess, going unbeatable in that section of the Southern Bell says a lot about your understanding of the game. I would guess to say that reaching 2200 is unquestionably within your reach! You’re right, but very few tournaments where I live. Orlando and Atlanta are the closest and they are four-hour drives. Nothing much in Tallahassee. I have plan to go ahead and finish something I started as a junior when I was much closer to 2200. Once you begin university studies, it gets real tough. Thanks for the nice words.